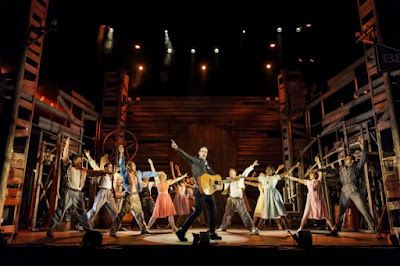 24th June 2015: A new musical has hit town, a small town in 1950’s USA, and a guitar-playing, hip-swivelling Chad rides his motorbike into town. Is he 'The Devil In Disguise' or a 'Hound Dog' in his 'Blue Suede Shoes'? The townsfolk are about to be 'All Shook Up' and could be headed for 'Heartbreak Hotel', but for Natalie, the love-struck, tomboy mechanic, it really is 'Now or Never'. Brought to us by the producers of Hairspray, Legally Blonde, Jersey Boys and West Side Story comes Love Me Tender, a hilarious, feel-good musical featuring Elvis Presley’s greatest hits. A few twists and turns and many love triangles throughout, the story keeps its pace with the addition of slick choreography and scintillating vocals. Lindsey Tierney who is first cover Natalie was playing the lead role this evening, and boy was she good! Couldn't fault her performance at all alongside Ben Lewis (Chad) who was equal to the standards. Mark Anderson playing the geeky sidekick Dennis was also very good, he has a very likeable charm about him and has a lot of comedy moments. Mica Paris (Sylvia) brings the house down with her enormous soul vocals... Bravo! The whole cast work incredibly hard, the harmonies are sublime and not a note out of place, often giving you that spine-tingling feeling on the crescendo. The arrangements of the Elvis Presley songs are second to none, and the band do a fabulous job sounding tight and crisp led by Patrick Hurley and John Donovan in the pit, on a very well designed sound system by Richard Brooker. As I said earlier, the choreography along with the directing is clever and slick, Karen Bruce has done a sterling job here, which is accented by the nice lighting designed by James Whiteside on a versatile set from Morgan Large. Anyhow, I think from me it's 'A Little Less Conversation', so 'C'mon Everybody' and go see this pleasantly surprising show.